﻿ Is there a war on? It is commonly recognised that interest rates have been at record lows since the 2008 financial crisis. In the UK, the Bank of England’s base rate was cut to 0.25% in 2016 and 10-year gilt yields traded at 0.5% that summer. Prior to 2008 the respective lows were 2% and 2.2%. It is also commonly recognised that the dividend yield paid by publicly traded equities has often been higher than the yield on government bonds in recent years. The extent of the differential between dividend yields and bond yields is, however, perhaps not fully appreciated. 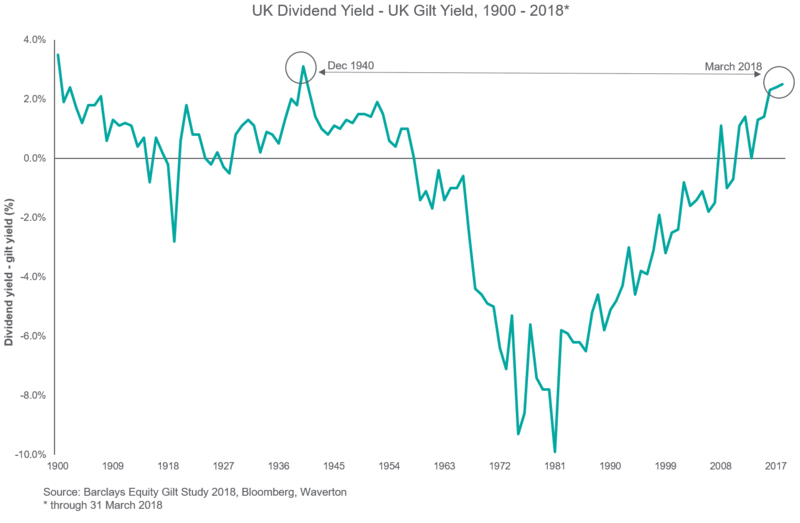 In the chart below we use end-year dividend and gilt yield data to show the relationship since 1900. At the end of the first quarter, the dividend yield on the FTSE All Share was 3.85% and the gilt yield was 1.35%. The differential of 2.5% is the widest it has been since December 1940. Things are pretty complicated in the UK at the moment but they are a bit better than they were in 1940. This highlights how attractive equities in the UK are relative to gilts even though we are nine years into the post 2008 recovery. It is possible that we have entered a new era where dividend yields will always be higher than gilt yields, as they tended to be prior to the 1950’s. But we think that is unlikely. In the United States the Treasury bond yield has generally been above the local dividend yield since 2008. The US and UK are the two financial markets with the longest continuous histories and are markets that generally have high correlations with one another so we expect the UK too will revert to the relationship between dividends and bond yields that was in situ prior to 2008. The current discrepancy between the US and UK is most easily explained by the differing monetary policies on either side of the Atlantic. The US Federal Reserve has been tightening policy since the end of 2015. The Bank of England has taken back its post EU referendum rate cut but has not begun anything recognisable as a tightening of policy. This has kept the gilt yield at historically extreme levels. In coming years we do expect interest rates to rise in the UK and as they do so it is likely that the dividend yield and the gilt yield will cross and return to the pre 2008 relationship. Between now and then we would encourage investors looking at the UK market to take advantage of a situation last evident a year before the United States entered World War Two.